In yesterday's episode "Income is Overrated" I talked about "me" and how to help out yourself. But I wanted to send a quick message about how you can invest in others. Spread the wealth with your team. Send cards around the holidays. Have some events for your employees and bring everyone together to show appreciation. Same with your family. If you have the money, take your family to dinner or vacation. Hello, everybody. 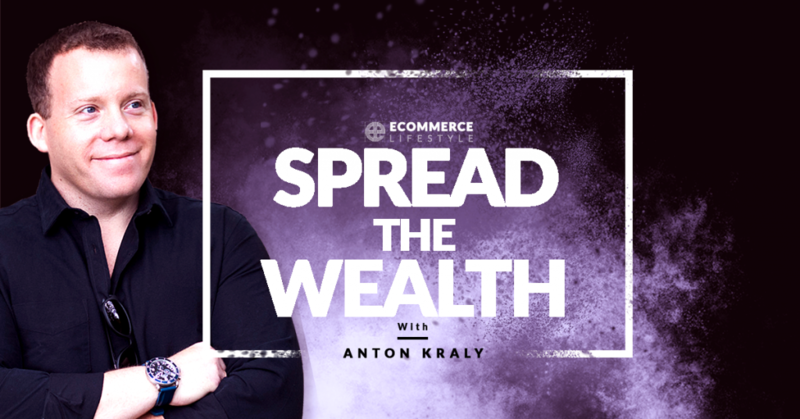 Anton Kraly here, and welcome to another episode of the eCommerce Lifestyle podcast. I wanted to record an episode, I know I've been doing a lot of these this month, but I wanted to record another one today kind of as a follow-up to yesterday's episode. Yesterday's episode was called Income is Overrated. Still stand behind everything I say there. Still think you should definitely go and listen to it, but this morning, I woke up to a message in a group chat that I'm in with all my best friends from back in New York that made me realize, you know what, there should definitely be a little extra added there. Unfortunately, in this group chat, without going into detail or anything, one of my best friends from growing up, one of his siblings is no longer with us, unfortunately. Just so sad to hear because I knew his sibling my whole life growing up. Just really good family friends and just friend-friends, so really, really sad thing to hear. What that made me think about right away is, again, how short life can be and what we can do to, I don't want to say just help, but what we can do to just share with people around us and do our best to make sure that not only are we the best that we can be and are we the happiest we can be, but the people that are around us, we're not responsible for anybody, of course, but we can definitely do our part to, I use the phrase, I guess, share the wealth, but really what I mean is share the joy and try to share experiences. Going back to ... That's, again, the only reason I would even bring this up and talk about it is because of the podcast that I recorded yesterday. Again, that episode is called Income is Overrated, and it's all about how you should not take actually take a lot of cash out of your business, but then what I was really hitting on is what you should be investing in and where you should be putting that cash. A lot of it was you, you, you. For me, I was talking about for me, me, me like invest in yourself, invest in your education, invest in your self-improvement, invest in your business, invest in more traffic, investing growing your wealth. Again, a lot of it, from my perspective, I was talking about me, me, me, and if you were listening, obviously, it sounded like it should, which is invest in you, you, you, which is all true. But I just wanted to, again, add this little note to it that things that I do also that I should've shared yesterday is try to invest in people around me, my team, different contractors, even different suppliers in our ecommerce businesses, doing things like making sure that they are noticed, which is free, doing things like sending gifts, just sending cards around the holidays, trying to do different events. If it's your company and you have employees around you, just showing them you care. Again, investing into that by doing different ... We do our annual retreats for my company Dropship Lifestyle, so everybody comes to those, but just trying to bring people together, try to do, every once in a while, even once a year, do a dinner. Just show appreciation. Again, just things with your family too, not business-related, but if you can afford to, if you're blessed and if you work hard enough to have a profitable business. I'm not a fan of giving anybody money but I do try to do things like take my family out as much as I can, try to arrange vacations that are obviously on me, but I just like to do that because, again, try to share it. I don't want it to seem like if you only listen to yesterday's episode that you should be some self-centered person, that all the cash goes to you and your business and that's it. You should definitely try to spread the wealth, spread the joy because money, you could definitely do thing with money that make you happy, but the money alone isn't what makes people really be happy. Usually, it's how you share it and how you can contribute to other people and usually the joy you get from being around them. Just keep that in mind. That's all, guys. Just wanted to share that today. Know it was a super short episode. If you're looking for any actionable tips, again, some of this stuff could apply to yesterday's episode as far as write-offs go, but, yeah, things like around the holidays, having holiday parties for your team and anybody you work with, sending things like bottles of wine or flowers or any kind of small gifts like that to some of your top either vendors or shipping brokers or even ad account managers. With family, again, try to include them because life is short. You never know how much time you'll have with everybody, so try to make the most of it and share what it is that you earn. That's it, guys. I'm going to into the office and start the day. I will talk to you all in the next episode of the eCommerce Lifestyle podcast. See you, everybody. The older I get the more and more important this feels.